Though Major Crimes didn’t bring in big ratings like The Closer, the spin-off still did very well. Will it continue to do so or, will the ratings fall in season two? Will the TNT series be cancelled or renewed for a third year? We’ll have to wait and find out. Airing on Monday nights, Major Crimes features the talents of Mary McDonnell, GW Bailey, Tony Denison, Michael Paul Chan, Raymond Cruz, Kearran Giovanni, Phillip P. Keene, Jonathan Del Arco, Graham Patrick Martin, Robert Gossett, and Nadine Velazquez. There are 19 installments this time — vs last season’s 10. The latest ratings are below and the list will be updated after each episode. UPDATE: Major Crimes has been renewed for a third season of 15 episodes. Final season averages: 0.8 rating in the 18-49 demographic with 4.74 million total viewers. Compared to the series debut last August, the season opener was down by 30% (vs 7.18 million). However, it was on par with the end of last season’s finale (5.13 million). 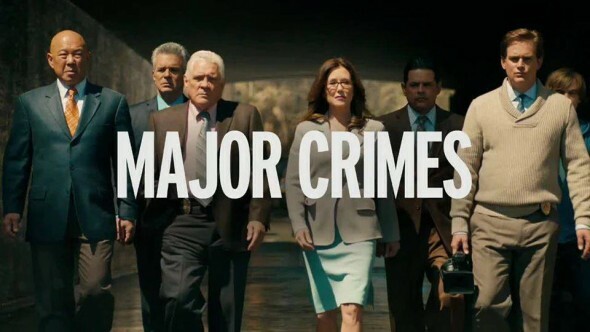 Reference point: The first season of Major Crimes averaged a 0.9 demo rating and 5.18 million viewers. What do you think? Do you still like the Major Crimes series? Do you think it should be cancelled or renewed for a third season?